I can’t believe that is has been a year ago that I was writing about this very same subject. Time flies when you are having fun! I have to admit that I am pretty tired of the rain we have had this summer since it seemed it came down only on the weekends so I hope the waning days of the solstice bring on more sunny days! The coming of fall means that some of the events that make this a fun place to live and visit cease only to make way for upcoming holiday happenings. 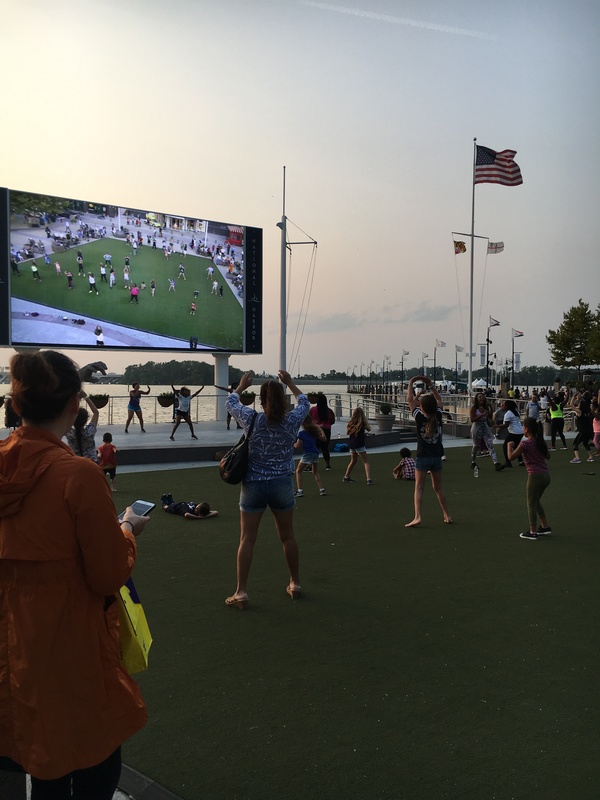 The Thursday “Date Night” and the Sunday “Family Night” movie screenings end this month along with the Friday Night Fun Night activities and the Sunset Concert Series. I celebrated 7 years of living here in the Harbor last month and I have to admit that I probably haven’t taken advantage of as many of the free events that have taken place over the years that I should have, but this summer has been different. My schedule has been such that I have spent several Friday evenings having some fun on the plaza with old friends and making new ones and have watched my fair share of movies on the big screen on both Thursdays and Sundays. I’ve only made it to two Sunset Concerts since they are on Saturday and this year it isn’t because we were sailing but because of the damn rain for the most part and a couple of weekend trip to the mountains. Just like last year I am hoping that this column will get you revved up for joining in on some of the last of the summer fun. Unless you plan to get to the Plaza early to score a seat in one of the Adirondack chairs available or don’t mind sitting on one of the several granite benches, you might want to bring a cushion for the benches, a camping chair or a nice blanket to sit on during the movies. The “astro-turf” that compiles the “lawn” does have a padding of sorts under it to add a bit of cushion. Folding chairs are set up on Saturdays for the Sunset Concerts but if the weather is really nice, they fill up fast so bringing something to sit on as a backup is a good idea. As far as food and beverage are concerned, there are several good places to grab something “to go” and special food vendors that set up (hot dog stand, popcorn/kettle corn and lemonade, etc.) on Fridays, Saturdays and Sundays. Feel free to bring a picnic of your own, however, no alcoholic beverages are allowed outside the confines of established restaurants. 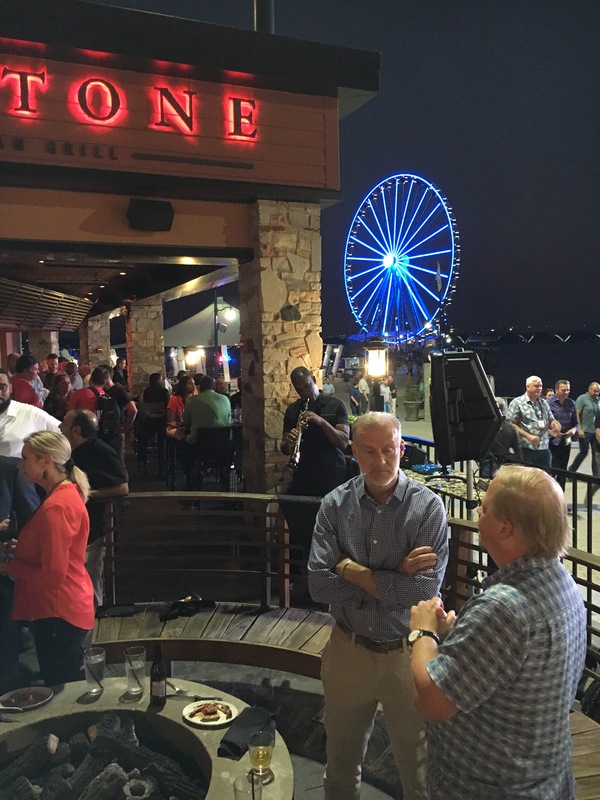 If you want to imbibe during a movie or concert, you can enjoy them from the outdoor patios of Bond 45, Rosa Mexicana, Fiorella’s and a portion of the McCormick & Schmick and Redstone patios. The movies and concerts start while the sun is still up and I have to admit it has been a tad hot on the Plaza on a few nights and getting in just the right shadow on the east side of the big screen was a challenge – mostly on Sundays since the crowd involves lots of kids. The up side is that you get to witness the beautiful sunset as it drops down behind the Capital Wheel and the shore of Old Town Alexandria. The selected movies are all ones that everyone can watch and the concerts will definitely bring out the patriot in you. There are many, many talented musicians and vocalists in our Armed Forces. The Singing Sergeants are one of my favorites. A list of the September movies and concerts is on the calendar of events. I think I will miss the Friday Night Fun the most – festivities run from 4 pm – 8:30 pm. This weekly event draws a very diverse crowd from both an age and ethnicity perspective. There are babies in strollers and Senior citizens with walkers and everything in between. There are people from all over the world enjoying each other’s company. Just what we need in this day and age! Games the likes of the still popular Corn Hole, Giant Jenga, Hula Hoop, and Connect Four are just a few. Sometimes you find kids who have never met before kicking a soccer ball or tossing a football around. One of the highlights of Friday nights is the arrival of Bobby McKey’s Rolling Dueling Pianos! Two of McKey’s talented performers entertain the crowd with requests as well as some old favorites. They arrive around 6 pm or so and their performance is followed by a DJ who rocks the Plaza out with popular tunes from yesterday and today. They always have the crowd up and dancing – even in the rain! Mother Nature doesn’t spoil the fun- unless it involves lightening and a down pour! If you are a regular reader of the OTC and this section, you know that we have FREE fitness classes on the Plaza as well spring, summer and fall. Umm…I haven’t actively participated in any of them….Umm….they run through the month of October so maybe I will give a couple of them a try this month and report back to you afterward. I know that a little Zumba wouldn’t hurt me! Something we didn’t have last year that we have now is the Flight Deck at the base of the Capital Wheel. There have been a couple of attempts at utilizing this space over the years but Derek and Icon Attractions figured it out this year. I have featured the Flight Deck in previous columns but I can’t stress what a cool place it is to watch the sunset. 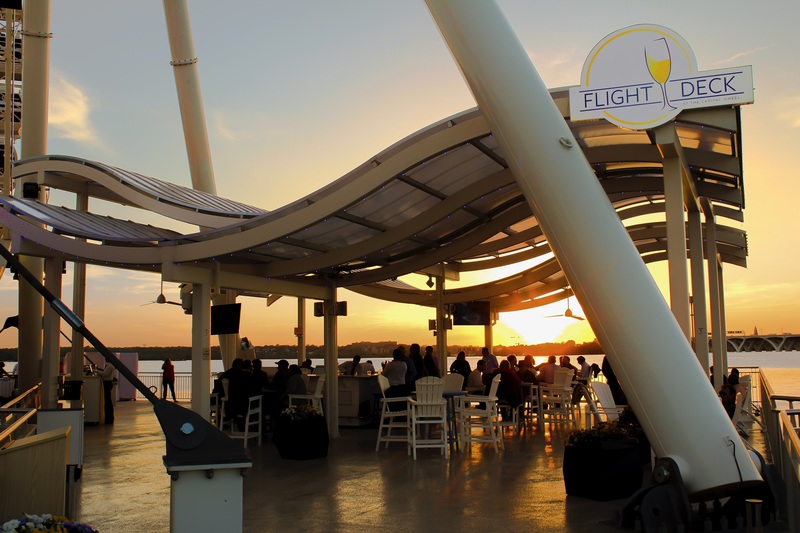 While they only serve wine, beer and sangria along with soft drinks and water accompanied by popcorn, peanuts and Dippin’Dots, just sitting at the bar or at a table doing a little people watching – both on and off the water – it is worth the stroll to the end of the pier. Come on over and take advantage of any or all of these events. Looking forward to winding down the summer with you.